Lancaster Friends Meeting is a place where we can be enriched by learning about each other’s stories. We were fortunate to have Isaac Abongela and Rebeka Andjelani share their story with us during a Forum several weeks ago. Included in their story was how the Friends Meeting was started in their home town of Abeka, in the Congo. Isaac explained that the Friends Meeting started in Abeka, Democratic Republic of Congo, in 1981. It was an outreach of the Burundi Friends Meeting in Kibimba, Burundi. The pastor from the Burundi Friends Meeting, Pastor Bamboneho Etienne, visited the Congo regularly to assist in starting this new Friends Meeting. Subsequently, Quaker missionaries from America (Robert [last name unknown] and John Morris) also visited, as well as a Burundi Quaker living in America (Kaman Kikweba). They came to encourage the new Friends Meeting. Larger groups of Quakers from the Burundi Meeting came to Abeka as well, and stayed for longer periods of time. All of these visitors convinced many people in Abeka to become Quakers. Isaac had grown up in the Methodist Church, as had Rebekah. When he heard the visitors from Burundi, and the American missionaries, telling him about Quakers, he was “so happy.” He wanted to become a Quaker. He was particularly interested in their peace stance. Isaac said, “The world needs peace!” Isaac was able to convince Rebeka to become a Quaker also. Isaac explained that this was because she loved him; Rebeka agreed, with a laugh. Isaac’s father gave his house as a gift, to become the home of the first Friends Meeting in Abeka, Congo, though he himself never became a Quaker. In September, 1991, the Abeka Friends Meeting received a document from the Congolese government authorizing the Abeka Friends Meeting. By that time, there were about 400 Quakers gathering in Abeka. In 1992, Calvin Coday and his wife, Twila, came to Abeka to live with Isaac and his family. They were Quaker missionaries from Kansas. They built a hospital in Abeka. Twila Coday was a doctor, and Calvin built the hospital with the help of many people in the area, even people from other churches. There was no hospital nearby, so people liked this project. Isaac and Rebeka were married in the Quaker Friends Meeting in Abeka, Congo in 1995. Isaac became very involved in the Abeka Friends Meeting. He would sing in the choir and was also the choir director. Isaac noted that, currently, the Congo has six monthly meetings; Abeka, Baraka, Urira, Atungulu, Mikenge, and Kigongo. Isaac speculates that there are 4,000 Quakers in the Democratic Republic of Congo at this time. Isaac and Rebeka invite Quakers in the Lancaster Friends Meeting to visit the Quakers in the Abeka Friends Meeting in the Congo, whenever possible. Many of us hope we will be able to do that some day. Things became more difficult for Isaac and Rebeka with increased conflict in the Congo. Isaac and Rebekah had to flee the Congo and lived in a refugee camp in Tanzania for 20 years. A few years ago, Isaac, Rebeka, and their children arrived in America. 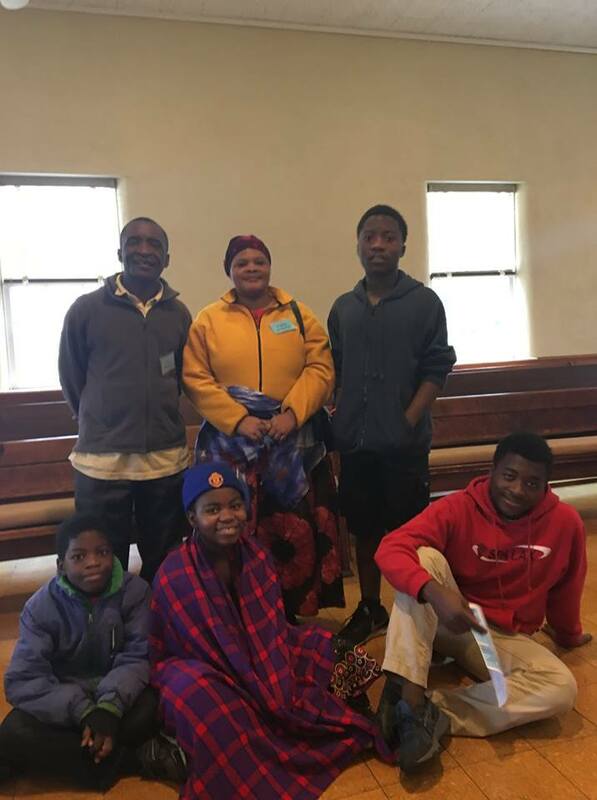 Isaac and Rebeka have four children here in Lancaster (Mmunga, Asukulu, Twila, and Peter), and an older daughter who lives in Missouri. Isaac and Rebeka miss their family and their Friends Meeting both in the Congo, and in Tanzania. They are hoping that more family members will be able to join them in Lancaster before too long.